I have procrastinated for so long with getting started writing this review that I've nearly finished reading the Random novel that follows it and also my computer refuses to start, so God only knows what will happen next on that front. In any case, I very much enjoyed A Handful of Dust. This is Evelyn Waugh writing in the same mode as Scoop, except that the end veers from the farcical into the horrific. The book is about Tony Last and his wife of several years, Brenda. The two of them live at his family seat, Hetton Abbey, which is some hours' train ride outside of London and the upkeep of which uses up the majority of their income. They have a young son named John Andrew. Tony loves the old house and life in the country, but Brenda could do with a bit more excitement. Enter John Beaver; young useless social parasite who takes advantage of the barest hint of an invitation to visit Hetton Abbey, draws Brenda's attention simply by being a bit of a novelty, and cuckolds Tony. So that's all fun and funny. The book is satire of course and it's good satire. Things take the occasional very dark and affecting turn, such as the very sudden character death that happens halfway through the novel, Tony's eventual fate, and even the tossed off statement about child sexual abuse that I've quoted in the section below (it really startled me when I read it initially, so be warned). Anyway, the themes here are a little beyond me. Of course it's about poking fun at the British upper classes who were undergoing a bit of a transition into the modern era at this point. But also I guess Waugh, Catholic convert in 1930, was trying to demonstrate that secular life was bad. He would be more successful with this if his characters were less cartoonish (I say, having enjoyed said cartoons very much). The edition of the book I read featured two different endings. 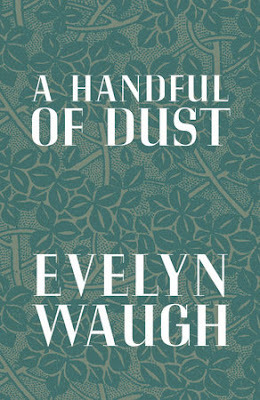 Waugh had to extract a part of the book that had been published already as a short story in the US in order to publish the book as a serial in an American magazine. The full novel, with short story left in and original ending, is much better, but it was interesting to get a peek behind the curtain. * If you are confused as to why this might even come up in a satirical novel about disinterested rich British people in 1930s London, suffice it to say that the novel takes a very surprising turn partway through. 'Tell me more about your terrible life,' said Tony, leading her back to the central hall. NB: This book is one of the entries on my Classics Club list! -M.R.